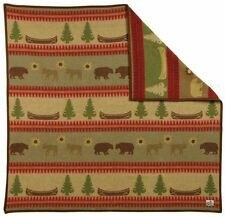 Navajo Print Throw Blanket Sherpa Southwest Native American Indian 50"x60"
Tortilla Blanket Burrito 60" Blanket Corn and Flour Tortilla 60" Throw | HOT! 1 x Electric blanket. Only used for bedding blanket. Can not be used if wet. Feature: Safe, comfortable,warm. Due to the difference between different monitors, the picture may not reflect the actual color of the item. Real Fur Leathercraft Patchwork Rabbit Skin Fur Pelt Genuine Rabbit Leather Hide. Multi-use rug for: sofa, car seat, chair, floor, bed, souvenir etc. Matrial :RealRabbit fur. In this way, you will know the process of your parcel. Victoria Secret Love Pink Soft Plush Throw Coral Fleece Air conditioner Blanket. Custom Blanket 58" x 80" (Large). 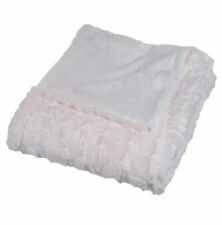 High quality blanket, Supersoft, Washable, Anti pilling. 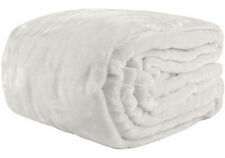 All blankets are white colored with black satin trim. Machine washable and dries quickly. Multi-use rug for: sofa, car seat, chair, floor, bed, souvenir etc. Matrial :RealRabbit fur. Fur length :3cm. In this way, you will know the process of your parcel. Color : black. SUPER SOFT DECORATIVE THROW. No Matter What, I'll try to Make It Right. Good preown/used clean condition. Lot of 2 LIVING QUARTERS Super Soft Micro Cozy Throw Blankets Blue Green 50"X60"
Blankets and throws are incredibly useful, functional items. Whether you use them as decoration or on the bed to add extra warmth, having a few extra around is always a good idea. 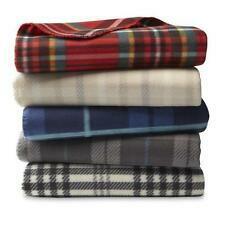 Blankets and throws range from simple white coverings to plush fuax fur or patterned cotton knit coverings. What types of throws and blankets are there? Wool - Blankets and throws can be made from merino, alpaca, and even soft cashmere. Wool blankets come in a variety of colours, from muted greens and reds to brilliant white. Cotton - Blankets and throws made out of cotton blends are often very comfortable for snuggling up to sleep or to watch a movie. These throws and blankets are versatile and have a number of different colours and patterns. Fleece - Covers made out of fleece are soft to the touch and have a silky feeling. Down and down alternative - These coverings are filled with duck and geese feathers while down alternative throws are made with synthetic or other natural materials. 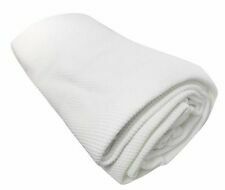 These white blankets and throws are super warm and often used for bedding. Faux fur - Plush white faux-fur blankets and throws work well as part of a bedding set or thrown over furniture to add a hint of luxury. What can blankets and throws be used for? Bedding - Blankets and throws can make a bed look more inviting and make it the centrepiece of a room when a white faux-fur throw is draped across the duvet. Decoration - Some keep a throw on a couch or other piece of furniture for easy access. Ground coverings - Knit cotton or wool blankets may work as ground covers for picnics or when you want to sit and read at the park. What considerations should be made when choosing blankets and throws? Fabric - Some are soft and warm for sleeping while others are not comfortable and may be better for lounging. colour - White blankets are universal when it comes to matching decor. However, kids may find white boring, so a colourful pink or blue cover may be more desired. Size - Blankets come in a variety of sizes to fit different size beds. 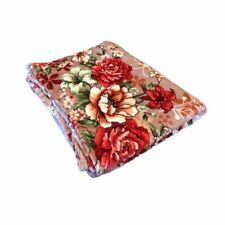 Throws are often smaller than blankets are may be used to cover cold feet or add comfort. Heft - Thicker blankets and throws made from heavier fabrics may feel heavier when covering the body. This can be comfortable for some but make others feel too hot at night, so they may want lighter sheets. Electric - Some cotton blankets have wires that run through them that heat up. Electric blankets can add some extra warmth for the coldest nights.